Every year Christmas seems to sneak up faster and faster. It feels like when school starts in August, its a nice steady jog to Halloween, a nice run to Thanksgiving and then a dead sprint to Christmas! With everything going on, baking cookies is not on the top of my list. But no need to stress, Mrs. Thinsters is here to help! With NO GMO's, ​NO corn syrup, NO artificial flavors, colors or preservatives, it tastes like a healthy oreo. "Extra crunchy + extra crispy = extra good!" 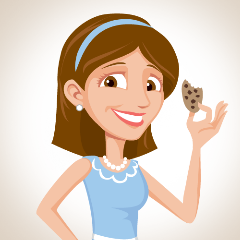 According the Wegmans information page, this is the story behind the Mrs. Thinster Cookie. "One cold winter morning, I started to make a batch of my favorite home-made Chocolate Chip cookies. I laid out the premium Non-GMO ingredients in separate bowls: flour, brown sugar, eggs, butter and the most delicious semi-sweet dark chocolate chips. Realizing there was only enough cookie dough to make one tray and needing more, I placed the dough on the baking sheet using a teaspoon, not a tablespoon. The results were thin, crispy, extra crunchy cookies that my family and friends loved!! From that day on, I was known to everyone in the neighborhood as Mrs. Thinster! Now I make my Cookie Thins using the same home-style recipe, with premium ingredients in small batches for the whole world to enjoy." Mrs. Thinster to the Rescue! 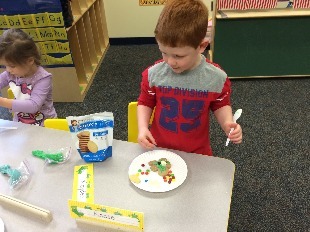 Last week I went to Tucker's school to help with cookie decorating and I did not have time to bake fresh cookies that would be healthy for Tucker and his classmates. Never fear, Mrs. Thinster is here! I grabbed some Mrs. Thinster's cookies and make my own frosting. What's my recipe for frosting you ask, well here you go! Mix all ingredients in a mixer and then place in a piping bag. Don't have a piping bag? (Don't worry, neither do I) Place frosting in a ziploc bag, and cut a corner off. 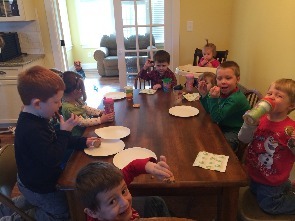 This past Friday, we had a Birthday Party for Jesus and what birthday party is complete without a cookie? Again, with little time to bake fresh cookies, I grabbed each flavor of Mrs. Thinsters cookies (Cake Batter, Brownie Batter and Chocolate Chip) and my left over frosting, chocolate chips and the ever so popular bottle of sprinkles. Before I knew it, kids were decorating their cookies and eating them as fast as they could. You would never guess that these cookies were actually healthier than the average cookie! The neighbors came over for our Annual Cookie Swap and I thought, why not decorate some Mrs. Thinsters cookies! A quick trip to Target later and Mrs. Thinsters was back at my side and with some whipped cream, chocolate chips and candied pineapples left over from my Figgy Pudding Recipe, we began decorating. It worked out great just like it had before. Not a single complaint! My guess is that this next week there will be cookie swaps, forgotten neighbors gifts, Christmas parties where you are panicked about what treat to bring, but don't get stressed. 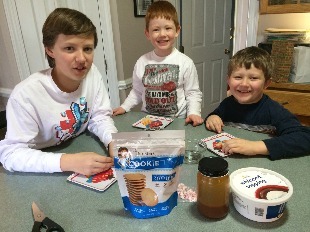 My suggestion is grab a bag or two of Mrs. Thinsters cookies, make your own frosting and decorate them at home, or have everyone decorate their own! Only 4 more days until Christmas, and don't want to spend three and half of them baking in the kitchen? 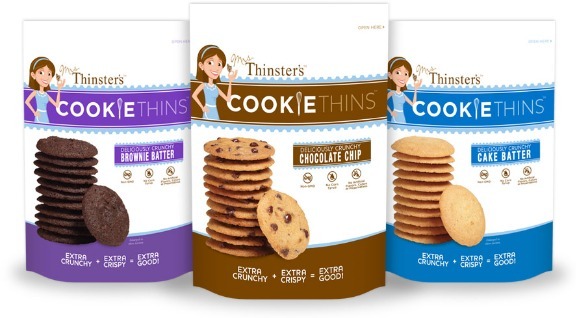 Grab some Mrs. Thinsters cookies because, where there's a meal, there's a way! great ideas to get you ready for the New Year. The Mays are going clean in 2015! Target, Sam's Club, and Amazon to name a few! They are amazing! Does she have any gluten free versions? Everyone raves about these cookies! Hey Patricia- I don't believe they offer any gluten free flavors at this time, but that is a wonderful idea!